Horikawa and Todaka battle for vacant Japanese crown! The Light Flyweight division is one of the most interesting, with so many amazing fighters at the top of the division. It's perhaps not got the huge amounts of attention of some other divisions, but it is a brilliant weight class, for us the best in the sport right now. At the end of 2018 Tetsuya Hisada vacated the Japanese title, to pursue a world title fight, and is expected to face Carlos Canizales later this year. With Hisada vacating, rather than face mandatory challenger Kenichi Horikawa (38-15-1, 12), we'll see Horikawa battle against Satoru Todaka (9-2-4, 3) to crown a new champion, with that bout taking place on February 14th at the Korakuen Hall. Horikawa earned his shot by winning an eliminator back in October, stopping Koji Itagaki. On paper that win over Itagaki had set up a 4th clash with Hisada, before Hisada chose to vacate and chase a world title fight, giving Horikawa a shot at the vacant title. The 38 year old Horikawa, who debuted way back in 2000, is a true veteran of the ring with 54 fights. Despite suffering 15 losses in his 54 bouts Horikawa has truly fought a who's who, including Akira Yaegashi, Florante Condes, Edgar Sosa, Ryuji Hara, Noknoi CP Freshmart, Yu Kimura, Shin Ono, Kenshiro and the aforementioned Hisada. He typically comes up short against the top tier fighters, but did stop Shin Ono, holds 2 wins over Hisada and gave hell to Kimura and Kenshiro. Despite being 38 Horikawa has a really good energy and work rate. He comes forward a lot, uses decent upper body movement to apply pressure and looks to force a fight. Despite being an offensively minded fighter Horikawa is smart with his pressure and limits his output at times, trying to draw mistakes and get inside. His jab and hook are not what they once were in terms of speed, but he does have good timing and does enjoy having a fight. If, or when, he gets inside he can make things violent and rough, and that's when he's at his best, picking up the work rate and grinding people down. Todaka is a bit more of an unknown. The 29 year old made his debut back in 2014, losing to Yukiya Hanabusa, and hasn't really scored any wins of note. What he has done however is proven very tricky to beat, with only Hikaru Ota stopping Todaka. The loss to Ota actually tells us quite a lot about Todaka, who has adjusted his style since that defeat. Against Ota we saw Totaka get into a war, standing and trading and looking to go blow for blow with a pretty underrated fighter. Those blows resulted in a nasty cut that forced the doctor to stop the bout. Although Todaka's style has changed slightly he is still, for all intents, an aggressive fighter, who comes forward and throws a pretty decent volume of shots. He's not particularly heavy handed, quick or accurate, but he's aggressive, looks strong and pressures opponents on to the back fighter behind his guard and footwork. Sadly for Todaka it looks like his style is made to order for Horikawa, who very much a better version of Todaka. Both press the action both enjoy a war up close and both let their hands in range. Sadly for Todaka we can't see how he wins a war with Horikawa, who hits harder, is more experienced in that type of bout and physically stronger. If Todaka can instead use his younger legs, move in and out more and not try to march Horikawa down he has a chance, but the reality is that we see Todaka fighting Horikawa's fight, and losing. If we're right it would see Horikawa become a 2-time national champion, and potentially put himself in the mix for a bigger bout down the line. If Todaka can however shock us, he'll have a number of domestic fighters snapping at his heels for a title shot later in the year, such as Ryuto Oho or Taku Kuwahara. Horikawa and Hisada battle again..this time for gold! The Light Flyweight division in Japan right now is red hot. Not only does the country boast a trio of world champions, Kosei Tanaka, Ryocihi Taguchi and Akira Yaegashi, but the country also has a number of top contenders, like up coming world title challenger Ken Shiro and former champion Ryo Miyazaki. Recently Ken Shiro vacated the Japanese title, just weeks before a scheduled defense, as a result he scheduled opponent Tetsuya Hisada (27-9-2, 17) had his proposed shot at the belt changed. Instead of facing Ken Shiro in early April it was decided that he would take on veteran, and former champion, Kenichi Horikawa (32-14-1, 7). The bout will finish off a trilogy between the two veterans and decide the new champion, and should be a genuine treat between two men who are well matched and both have a lot to gain from a win here. Hisada began the year as the mandatory challenger for the title and when it seemed like that shot would come against Ken Shiro it seemed very hard to believe he would have any chance of winning the title. There appears to be a gulf between the two men, with Ken Shiro being not only the Japanese champion but also the Oriental champion and like a man who was ready to fight for a world title. Although a talented fighter Hisada's limitations really are domestic level. He's never fought for a title before and has had mixed success at Japanese level. He's currently on a 7-2-1 (7) run, showing real belief in his power, but in the past his power has been questionable and even now he's got a sub 50% KO rate. Saying that however he has often fought above Light Flyweight and his power is more telling than his records suggests. Like wise he's also a tough fighter, with his only loss coming to Hiroyuki Hisataka, a former multi-time world title challenger. Aged 32 Hisada is getting on in his career and this could be his one and only shot at a title. That could be the drive he needs to put in a career defining performance or it could well be that the shot is too late in to his career for him to make the most of it. After all if he's not managed to impose himself at the top of the division in Japan so far, will he ever be able to? Whilst Hisada might be a late bloomer it's worth noting that Horikawa didn't actually record his career defining win until he was 35 and he claimed the Japanese title, with a stoppage against Shin Ono. He may not have held the title long, but it was a career defining victory, and his first title success, and he has since added the WBO Asia Pacific title to his career achievements. His career has been a long and remarkable one, with fights against a real who's who of the Asian scene, like the aforementioned Yaegashi as well as Florante Condes, Edgar Sosa, and Yu Kimura. Horikawa's long career has had it's ups and downs but he's been a great servant and been a persistent figure on the Japanese title scene. He had his first title bout in 2009, against Yaegashi and would have numerous title fights before finally winning his first title. Although he came up short a number of times he was almost always competitive. Although he has 14 losses, he has only been stopped 3 times and has had a number of very close bouts that could have gone his way. Both fighters like to throw punches, both are veterans and both are under-rated, in terms of skills, power, work rate and toughness. Also worth noting that these two have faced off twice before and both times it was Horikawa coming out on top. Potentially that's another reason for Hisada to be particularly fired up here, looking for not only the title but also revenge for two of his losses. At their best Horikawa wins this, close but clear, but given he's now 37 and he's fighting for something he's won before, whilst Hisada is trying to claim a title in what may be his only chance we are favouring Hisada to just, narrowly, come out on top here. Shin Ono and Kenichi Horikawa meet in must win title bout! Sometimes it's great to have a long term national champion sorting the division out and taking on all comers whilst extending a reign to prove they really are the best in the country. On the other hand it can also be great when a champion vacates to focus on bigger and better challenges, whilst leaving an opening for a potentially brilliant match up. That second scenario has been seen recently in Japan at Light Flyweight, where Yu Kimura, a world ranked and potential world champion, has vacated the national title and left us with a title showdown between the two top domestic contenders. Those contenders are former OPBF champion Shin Ono (18-6-2, 2) and former multi-time title challenger Kenichi Horikawa (29-13-1, 6). Neither is a genuinely big name in the sport but both have styles that should gel well to give us an exciting war on September 17th. Of the two men Ono is probably the better known of the two and is, on paper at least, the more distinguished of the two men. In his 24 fight career he holds notable wins over Xiong Zhao Zhong, Yu Kimura, Toshimasa Ouchi and Omari Kimweri. On paper they are solid wins, though in reality they do generally come with small notes, such as Kimura being a 5 fight novice when Ono beat him, whilst the fights with Ouchi, Kimweri and Zhong were all paper thin. The most notable fight of Ono's is actually a loss, in an IBF Minimumweight title fight back in May 2014 to Katsunari Takayama. That bout saw Ono give Takayama some problems before Takayama came on strong to take a clear win, with the help of two late knock-downs. Since then however Ono has fought just once, more than 12 months ago, and has suffered an injury that ruled him out of a rematch with Kimura that was supposed to happen earlier this year. As a fighter Kimura is a talented and fast southpaw who moves a lot and lets his hands go a fair bit. On the hand he's also a jab busy fighter who rarely sets his feet and as a result lacks real power on his shots. This is why he's only scored 2 stoppages in 24 fights and why he hasn't had the success that his career has perhaps deserved given his in ring ability. Another issue is actually his southpaw stance and he has already been involved a trio of technical decisions. His biggest problem however will be inactivity, given he's not fought in a year and at 33, heading towards 34, he can scarcely afford time out of the ring. At 35 years old Horikawa is the older man in terms of physical age, however with 43 bouts, and 287 rounds on the clock, he's much older than his physical age. Not only has he got a lot of miles on the clock but a lot of them have come against talented fighters with losses to Akira Yaegashi, Michael Landero, Florante Condes, Edgar Sosa, Ryuji Hara and Yu Kimura, among others. Sadly for Horikawa 3 of those losses have come in Japanese title fights, which another has come in OPBF title contenst. In fact he is currently 0-6 in title contests. Whilst going through Horikawa's losses looks impressive it needs to be noted that he also has a number of solid wins on the domestic scene, including wins against Masayoshi Segawa, Norihito Tanaka, Hiroshi Matsumoto, Yusuke Sakashita, Tetsuya Hisada and Toshimasa Ouchi. In the ring Horikawa is a busy and tough fighter who combines those traits with a solid jab, impressive speed and under-rated technical ability, though he does have a knack of getting a bit wild at times. Looking at his record you may suspect he's a “bum” but the reality couldn't be further from the truth and in all honesty he's a real handful on the domestic stage. Unfortunately his biggest may well a combination of his lack of fire power and a mental problem in regards to winning a “big one”. If the pressure has got to him in the past then the same could strike here given that it will almost certainly be his last big fight. Coming in both men know what is up for grabs and both will fight like they mean it. That should give us a lot of action and a lot of exchanges. Given that both men are relatively tough, just a combined 5 stoppage losses between, and neither can punch with authority we're really unlikely to see a stoppage, we are however certain to get action. The question is who will impress the judges? It's a hard one to answer and one we suspect will be answered in a very competitive 10 round battle between two very well matched veterans. Interestingly it seems that youngster Ken Shiro is eyeing up the winner of this one for a show down in the near future. Whilst the two veterans are excellent fighters we suspect the youngster would have to be favoured over the winner, which ever way this one ends. 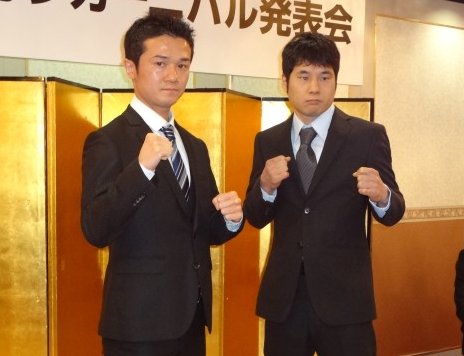 The second Japanese title fight of the year takes place on February 1st in the Light Flyweight division. The title, which was vacated late last year by Naoya Inoue, is up for grabs as the #1 ranked Yu Kimura (12-2-1, 2) takes on the #2 ranked Kenichi Horikawa (25-12-1, 4). From looking at the fighters records it'd be fair to assume that Horikawa would be the under-dog. Although he's more experienced with 38 fights on his ledger he has lost around 30% of his contests. This is however a case where numbers don't tell us the full story and in fact will mislead people. Horikawa, 33, started his career back in 2000 and actually started his professional career with a 3-4 record. Despite that poor start Horikawa developed and advanced his record to an impressive 17-5-1 by August 2008. Having won 14 of 16 fights he had genuinely established himself on the domestic stage and moved in to a position to get a national title fight. In 2009 Horikawa would get his first title fight. Unfortunately for him it came against Akira Yaegashi who narrowly outpointed Horikawa over 10 hard fought rounds to claim the Japanese Minimumweight title. Less than a year later Horikawa lost to Michael Landero in an OPBF Minimumweight title fight and since then his career has struggled for traction with losses in 4 of his subsequent 10 bouts. Although Horikawa has been losing fights regularly over the past few years he has been facing a high calibre of opponent with losses coming to Florante Condes, Edgar Sosa Ryuji Hara and Noknoi Sitthiprasert. Those losses, whilst bad on paper, were often competitive with the losses to Hara and Noknoi both being very competitive. Horikawa may have several losses but he has mixed in extremely good company and will have learned more from those losses than he will have learned from many of his victories. Aged 30 Kimura is the younger man though is much less experienced in terms of both quantity and quality of fights. He has been a professional since 2006 and started his career unbeaten through 5 bouts, going 4-0-1, before dropping a technical decision to Shin Ono. That loss was soon put behind him as he recorded 5 straight victories, including one over Masayoshi Segawa, to move to 9-1-1. Unfortunately for Kimura he would then run into his most well known opponent, Ryoichi Taguchi, who stopped him in 6 rounds to inflict the first stoppage loss on Kimura's record. Since then he has bounced back with a trio of victories though when you consider that the most recent of those came against Tatsuya Fukuhara, who was beaten by the debuting Takuma Inoue back in December, then it's fair to say he's not yet proven his real quality. The one certainty here seems to be that the bout will go the distance. Neither man has real power and in fact with just a combined 6 stoppages from 37 wins it's fair to say that neither man will fear the others power. Sure both have been stopped before but those stoppages have come to a higher level of fighter. Going in to this fight we know to expect a decision and we also assume that many will be picking Kimura, we however fancy that the experience of Horikawa will help see him through to the victory. He's proven to be tough, he's tricky and whilst not the most technically skilled he does look like the sort of fighter who will give anyone who lacks concussive power a real nightmare. Not only does Horikawa have the experience edge but he also knows that this will likely be his final title opportunity, that can help fighters find an extra gear and we think that will just do enough to see him over the line.